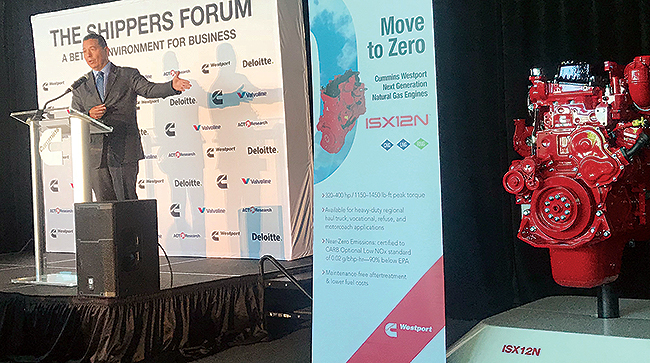 INDIANAPOLIS — Sales of Class 8 natural gas fueled trucks are rising, grants and incentives for using alternative fuels are expanding and more related regulations are coming as major shippers pursue environmental sustainability, experts said at an industry forum here. They said these changes are coming against a backdrop of rising need for alternative-fuel vehicles. 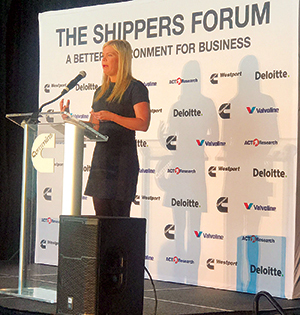 He and other speakers addressed the 2018 Shippers Forum convened by independent engine maker Cummins Inc. at the Indianapolis Motor Speedway Oct. 15-16. According to Lyou, more than one in three people in the United States live in a county that is in violation of the 2015 National Ambient Air Quality Standard for ozone, which at ground level is a harmful air pollutant. He noted that the Cummins Westport ISX12N natural gas engine on display at the event is certified to 0.02 gram per brake horsepower-hour, or 90% cleaner than Environmental Protection Agency’s 2010 engine emissions standard for nitrogen-oxide levels from trucks. “In actual operation, it has been shown to be 99% cleaner than the EPA standard,” he said. 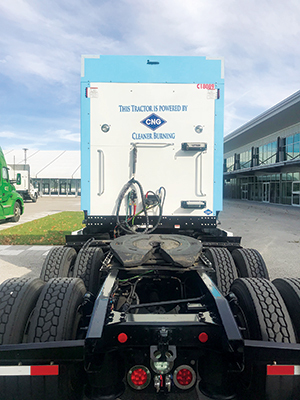 A key part of the challenge of increasing the use of alternative-fueled commercial vehicles is “reaching the right decision-makers,” said Hugh Donnell, North American truck market and truck maker business leader for Cummins Westport. He told Transport Topics that it is CEOs and boards of directors that must approve such a dramatic shift away from diesel — not the maintenance executives typically involved in the spec’ing of diesel trucks. At the same time, structural shifts in the trucking industry are encouraging the move to various alternative fuels, said Tim Denoyer, ACT Research Co. vice president. For example, the average length of haul is growing shorter, falling 31% to about 550 miles in 2017 compared with 800 miles in 2003. Natural gas trucks are supported by more than 1,000 fueling stations nationwide, he said — a network far larger than what is available for either electrified trucks or those using hydrogen fuel cells. 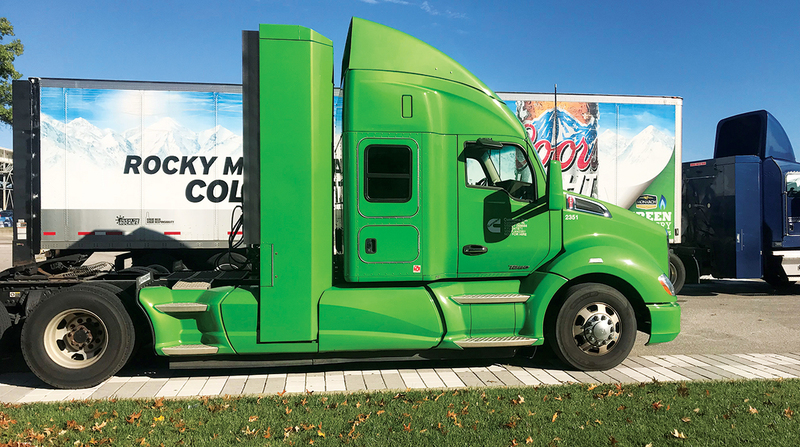 “In very broad terms, large for-hire truckload carriers are not really willing to try new [powertrain] technologies mainly because of how well diesel works,” Denoyer said. However, diesel engines face tougher EPA emissions standards for carbon dioxide and other greenhouse gases set to take effect in 2021, 2024 and 2027. Carriers that do switch to alternative fuels deserve recognition for making the move, another expert said. “It’s easy for [shippers] to demand certain actions, then take all the glory for using trucking companies that are more sustainable than others,” said Yossi Sheffi, director of the Center for Transportation and Logistics at the Massachusetts Institute of Technology. But those shippers aren’t going to pay for the equipment, “so someone else is going to have to put up” the money, he added. State grants and incentives are available to help, but navigating them can be a complicated landscape, said Lacy Buckingham, grant manager at Rush Truck Centers in Whittier, Calif.
California is expected to increase its voucher amount to $45,000 from $40,000 for new purchases and repowers for fleets buying alternative fuel engines including the ISX12N. The funds are coming from the Hybrid and Zero-Emission Truck and Bus Voucher Incentive Project and low NOx natural gas vehicle incentives. The program also provides funding for heavy-duty trucks using hydrogen fuel cells, but a proposed change would lower the voucher amount for vehicles that supplement fuel cell power with either combustion or plug-in range extenders. In Texas, “if you have a 2003 Class 8 truck that you scrap, you could get $161,000 to buy a new natural gas fueled truck. It can’t exceed 90% of cost, but that is a great opportunity. You are not only going to be cheaper than a diesel truck, you barely have to pay for a new truck,” Buckingham said. In the meantime, more trucking regulations are coming, especially in California where trucks more than 14,000 pounds that operate in the state are going to be required to have a 2010 or newer engine by 2023, according to the California Air Resources Board. CARB is going to “pursue regulations” to ensure the ports of Los Angeles and Long Beach — the nation’s two largest — go to zero-emissions trucks long term, he said. There are about 17,000 drayage trucks registered to serve the ports servicing the world’s leading shippers.